See the Helmet of the Royal Canadian Dragoons by clicking here. The often inadequate performance of the Canadian militia during the Fenian raids of 1866-1870 clearly demonstrated a need for better training at all levels. The British Army had long been the source of qualified instructors; but the British regiments sailed for home in 1870, leaving Canadians to their own resources. In 1883, to replace the personnel and expertise lost through the British departure, approval was granted for the creation of a small Canadian regular force of cavalry, artillery, and infantry. On 21 December 1883, Lieutenant-Colonel J.F. Turnbull was authorized to raise and command A Troop, Cavalry School Corps and School of Cavalry. During the following year recruiting brought A Troop to its established strength of three officers, forty men, and a number of horses. However, proper saddlery, valises, and carbines were not provided, and these items had to be borrowed from A Battery of the regular artillery and from the Queen's Own Canadian Hussars, a militia unit in Quebec City. 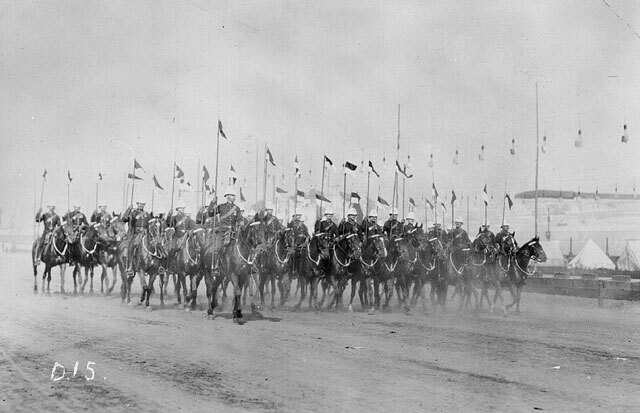 Active service came quickly for the Cavalry School Corps. On the outbreak of the Northwest Rebellion in April 1885, A Troop was joined by the Winnipeg Troop of Cavalry to form a mounted unit of General Middleton's North West Field Force. When the Rebellion had been crushed, the Cavalry School Corps resumed its normal peace-time task of training the volunteer militia cavalry. On 15 July 1887, the title Royal was conferred on the School of Cavalry.3 In 1891, it was recommended that the Permanent Force adopt the regimental system. The Cavalry School Corps was redesignated the Canadian Dragoons on 14 May 1892. On 27 June, the Canadian Mounted Rifle Corps at Winnipeg was amalgamated with the regiment and designated B Troop, Canadian Dragoons. In May 1893, the corps was given its present title, The Royal Canadian Dragoons. In December 1899, the Canadian government's offer of more troops for South Africa was accepted by the British War Office. A brigade of field artillery and two battalions of mounted rifles, designated the 1st and 2nd battalions Canadian Mounted Rifles (CMR), were mobilized. The Royal Canadian Dragoons provided most of the trained officers and men for the 1st Battalion. At the request of the unit while in South Africa, it was redesignated The Royal Canadian Dragoons on 22 August 1900. Upon landing in South Africa, the regiment was posted tothe 1st Mounted Infantry Brigade. Within days it had seen its first action, and was in continuous contact with the enemy for almost nine months. When the unit was withdrawn from active service in November 1900, it had marched 2740 km (1700 mi. ), taken part in twenty-eight engagements, and was reduced from a strength of 400 to three officers and eighty-three other ranks. In the performance of this demanding service, the unit had been awarded thirteen decorations including three Victoria Crosses. When war broke out in 1914, The Royal Canadian Dragoons, Lord Strathcona's Horse (Royal Canadians), and the RCHA Brigade went overseas with the 1st Canadian Contingent. From this group the Canadian Cavalry Brigade was formed in January 1915. Initially, the 2nd King Edward's Horse was the third regiment; but it was replaced in September by the Fort Garry Horse, making the Brigade an all-Canadian formation. The Brigade landed in France in May, just in time to take part in the Battle of Festubert - as infantry! For the duration of the war, the Dragoons performed as infantry and cavalry. Its most memorable action took place on 30 March 1918, when the entire Brigade carried out a classic cavalry charge at Moreuil Wood. In 1919, the regiment resumed the peace-time routine of a regular cavalry unit. Although there was much debate on the future of horsed cavalry, the question really had been settled at Moreuil Wood, where machine guns cost the Brigade some 300 men and 800 horses in only ninety minutes. Nonetheless, when war was again declared in September 1939, The Royal Canadian Dragoons was still a regiment of horsed cavalry. With precious little demand for horse-soldiers, the regiment remained behind while the infantry divisions proceeded overseas. With the formation of the Canadian Armoured Corps in August 1940, however, The Royal Canadian Dragoons went on active service as an armoured car regiment, first as a unit of the 5th Canadian Armoured Division, and later as corps troops with the 1st Canadian Corps in Italy and North-West Europe. After the war, the regiment exchanged its armoured cars for tanks, and became Canada's senior armoured regiment; but the graceful South African springbok on its badge remains a constant reminder of the service performed by The Royal Canadian Dragoons as horsed cavalry. The original recruits of the Cavalry School Corps were issued the standard Canadian militia cavalry uniform of hussar pattern in 1884. It consisted of a dark-blue hussar jacket heavily braided on the chest, back seams, hems, and cuffs with yellow woollen cord. Described in dress regulations as buff, the collar was, with the characteristic perversity of British military custom, white. Dark-blue overalls with a double white stripe were worn in dismounted dress, and similar pantaloons were worn with black Wellingtons and steel spurs in mounted order. The dark-blue pillbox forage cap was trimmed with a band of gold lace for officers and senior NCOs, and with white cloth for other ranks. The hussar busby with white plume and bag, and gilt chin chain was prescribed for full dress, although militia cavalry was issued only forage caps. Full-dress head-gear was purchased privately with non-public funds by some units. The officers of the permanent cavalry were required to provide themselves with full dress, including busbies. However, it is not known whether busbies or helmets were issued to the men. Given the character of Lieutenant-Colonel Turnbull, it is likely that his regular cavalrymen were properly turned out, even if this meant borrowing busbies from his former unit, the Queen's Own Canadian Hussars. Officers' dress was similar in pattern to that of the men, with gold lace and braid replacing the yellow worsted cord. The amount of braiding on collar and cuffs increased with rank. A dark-blue patrol jacket trimmed with black mohair braid was worn for normal parades and duties. A blue frock-coat elaborately braided with black mohair was adopted for dismounted undress order. The handsome hussar uniform required a great deal of upkeep.. Pipeclay was used to clean the white collar; the yellow braiding was treated with a wash of chrome yellow to restore its colour. The General Officer Commanding the Militia thought the choice of the hussar-pattern uniform for militia cavalry a most unhappy one. It was his view that "the quantity of braid on the tunic requires great care and trouble to keep clean, and with, very often, uncleaned sword, boots and spurs (the two latter being very much according to the fancy of the wearer) the cavalryman presents a tawdry appearance which, is not pleasing to the eye." Once a cavalry school was established, the General recommended the adoption of a simplified uniform of dark blue with scarlet facings, a belt of black or brown leather, and a helmet. Although some of these sensible recommendations were adopted, most were ignored, probably because of the cost of obtaining new uniforms for the volunteer cavalry. The original equipment of the Cavalry School Corps consisted of a white buff leather pouch belt with black pouch, and white sword slings and sword-knots. The sword issued to the troopers appears to be the 1882-pattern British cavalry sword. Their carbine was the Snider-Enfield, although Turnbull complained bitterly about this weapon as it was useless beyond 400 metres. On dispatch to the Northwest Rebellion, A Troop was armed with the Winchester Model 1876 carbine. It was vastly superior to the Snider, but Turnbull continued to press for the new Martini-Henry cavalry carbine. When the corps was re-designated Canadian Dragoons in 1892, and subsequently The Royal Canadian Dragoons, the dress was changed completely to that of dragoon pattern: scarlet cavalry tunic with dark-blue collar, cuffs, and shoulder-straps. The collar was trimmed top and bottom with yellow cord, the yellow cord of the cuffs formed an Austrian knot, and the shoulder-straps were edged with yellow. Blue cloth edged the front of the tunic, which closed with eight brass regimental buttons. Dark-blue overalls and pantaloons were trimmed down the outside seam with a single wide yellow stripe. The granting of the title Royal also was accompanied by authorization of unit badges of the Royal Cypher surmounted by the Imperial Crown.10 A white Canadian-pattern helmet with brass spike, chin chain, and helmet plate was worn in full dress. The band on the dark-blue pillbox forage cap was yellow cloth for the men and gold lace for officers and senior NCOs. In keeping with the recommendations of the General Officer Commanding the Militia, the pouch belt, waist-belt, sword slings and gauntlets were of brown leather, which did not require cleaning with messy pipeclay. Black Wellington boots with steel jack spurs were worn in mounted orders of dress. For drill and service dress the men were issued a red serge five-buttoned frock with blue collar and shoulder-straps, and plain cuffs. At the same time the corps finally received the Martini-Henry carbine. It also carried the 1882- and 1885-pattern British cavalry sword with steel scabbard. Lances were carried on some occasions, although this was not normally a weapon for dragoons. The plate depicts a field officer of The Royal Canadian Dragoons in full-dress mounted order in 1897. The heavy gold braiding on the cuffs is indicative of his senior rank. In the background is an officer in the dark-blue patrol jacket trimmed with black mohair tapes and braid. During one engagement in South Africa, the stealthy approach of a party of Boers was signalled by unusual activity among a herd of nervous springbok. Heeding the warning of the graceful animals, the detachment stood to in time to beat off a determined enemy attack. To perpetuate this event, authority was granted to adopt the springbok as an official badge of the regiment, in addition to the Royal Cypher.15 The bounding springbok is still worn by the regiment as the cap and collar badges of The Royal Canadian Dragoons. Shortly before the outbreak of war in 1914, the regiment replaced the white helmet by the brass dragoon helmet with black plume. Once again, white buff-leather belts and slings made their appearance to differentiate between service dress and the full dress reserved for ceremonial parades.